Thinking of Japan in general with it’s venerable history how odd to outsiders that there isn’t at least one primary manmade attraction that is known globally. When you think of Japan and things to see I guess most people immediately think of the human crush of Tokyo with it’s girls dressed like spooky Victorian goth dolls heading off for their solitary evenings in coffin-like cubicles while nerds gush over the latest gadgets and manga in Akihabara, in the distance looms a Mount Fuji where it is minutely photographed from every possible angle and further to the south hidden Kyoto before sweeping across the horrors of Hiroshima, where at night the silence is shattered by the sound of sumo wrestlers, their bodies crashing together to the sound of excited cheers. Then further south still, the island of the ancients, Okinawa, where the boketto centarians wrap their legs around their necks while practising yoga against a backdrop of quaint palm lined coves, the Pacific ever present. Mentally the north is just a dark void where you can find monkeys frolicking in volcanic pools as snowflakes flutter around before resting on their noses. That’s just the vague idea of Japan, there are no supericonic structures on scale with the Taj Mahal or Macchu Picchu. I guess if there was one memorable structure it has to be Kinkaku-ji in Kyoto. The guidebooks told me I should make a beeline for this pavilion clad in gold leaf. Upon reading further I realised this famous structure was nothing but an imposter. A novice monk with a persecution complex had reduced the original to cinders six decades ago, the present structure nothing more than a carbon copy only this time caked in gold leaf and often bathed in the crush of a thousand tourists. So often in Japan the date of historical sites seem obscure, almost as if they are hidden. They’ll proclaim a temple is 8th century but after doing research you realise the sacred ground and for instance a carved monolith are 8th century while the actual buildings are all modern i.e. 16th century reconstructions or younger still. In Kyoto it took me a while to figure out which locations should get my precious time, in the place nicknamed the city of 1200 temples this is no mean feat. 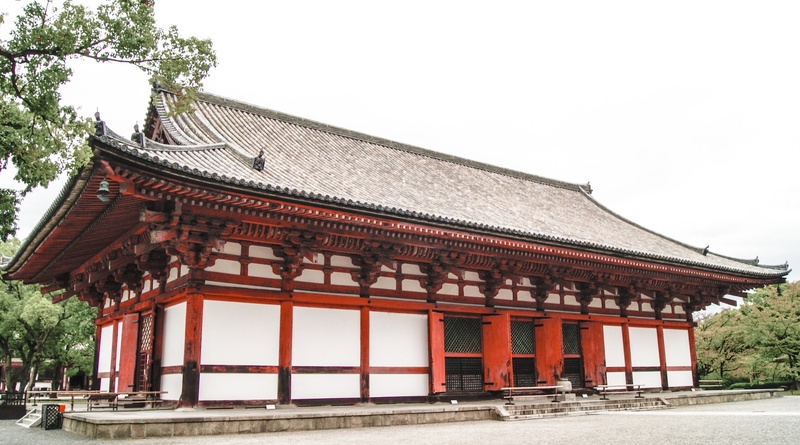 One location that stood out was To-ji, a Buddhist temple complex of the Shingon sect established in 796 and off the beaten track in the low heel Minami district south of Kyoto Station. 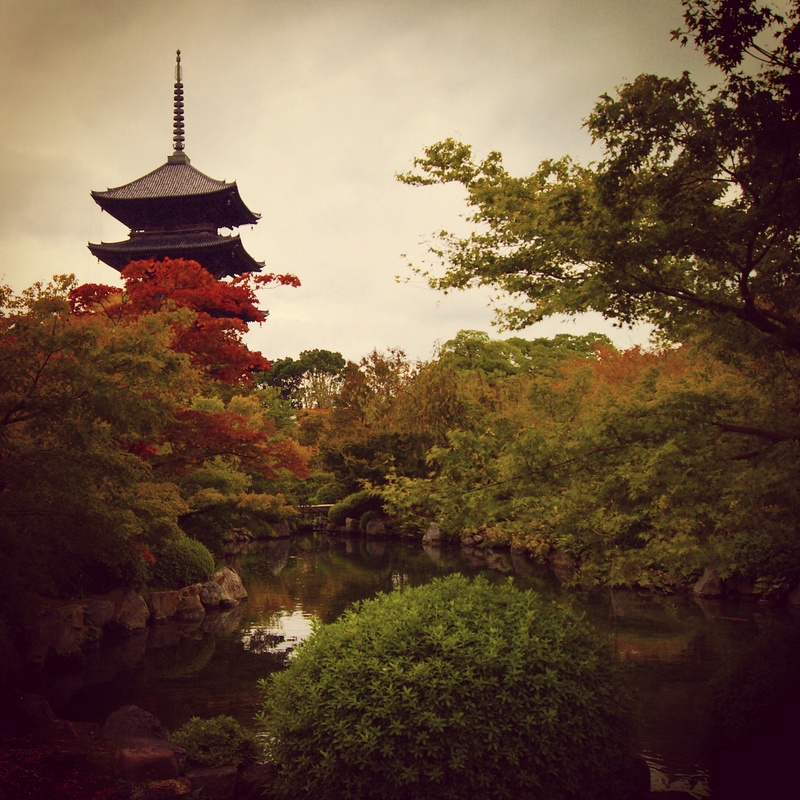 I chose to visit, a place steeped in history, actually one of the founding temples of Kyoto from the Heian Period and as old as Kyoto itself. Founded beside Rajomon gate, built to protect the city against the villainous trolls attacking the area at that time. After walking across concrete town with its business people you pass underneath the railway tracks of Kyoto Station and suddenly you are in a low rise residential area with its quiet streets, surprising how provincial it could get just metres from the main hub. 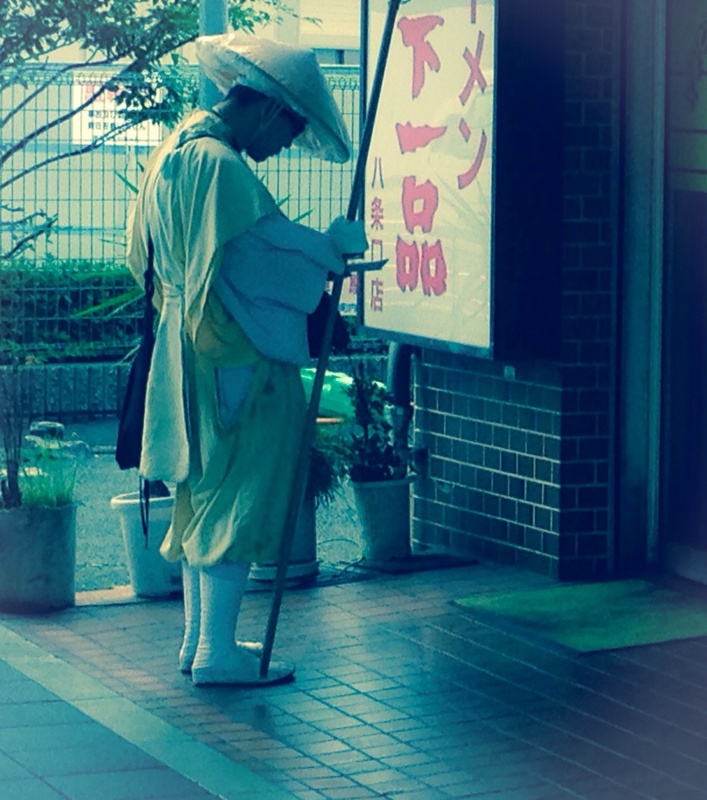 It’s rare that anything can get me to stop in my tracks but the sight above did, a Buddhist Zen monk chanting outside a shop, I wondered if he was paid by businesses to come by and wish luck or protection for the owners. That moment symbolized Japan so perfectly, neon flashing in the shop window clashing against the old monk and his religious writings. Upon reaching the outer walls of To-ji I was excited, an image of myself in blissful solitute contemplating the Heian Period against a backdrop of Japan’s tallest wooden tower, the five story Gojunoto pagoda. The temple grounds again were perfection, every pebble placed thoughfully to create a serene vista. 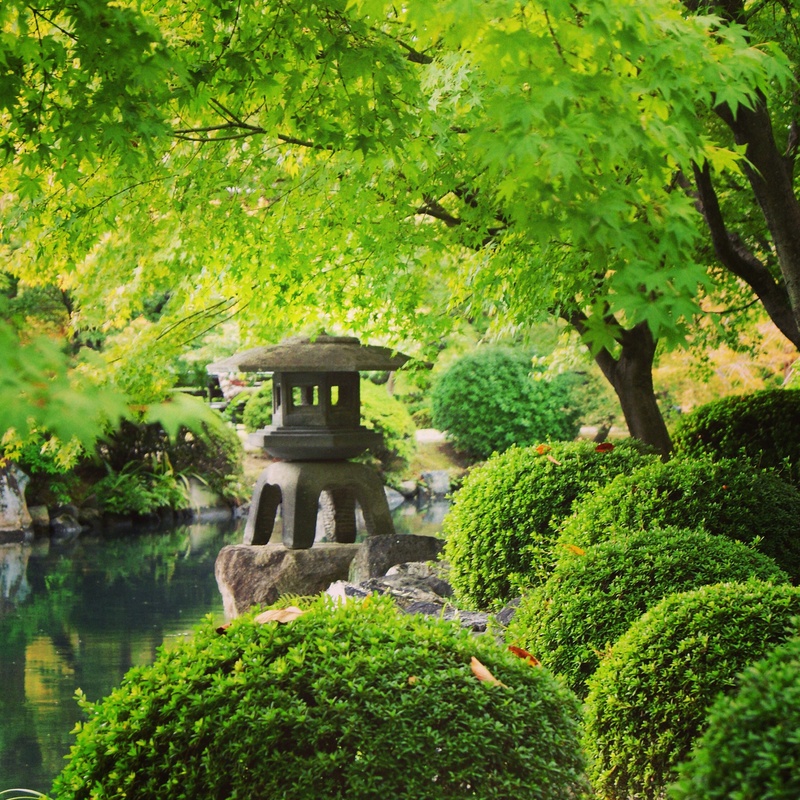 I scoured the gardens looking for the perfect vantage point to while away the hours and found it in the image above, the green foliage so harmonious against the still pond. On the left just out of shot was a lazy turtle resting on a rock. My moment of bliss was shattered every minute by the high pitched beeping of a pedestrian crossing outside the temple walls, again a perfect example of Japan, history sacrificed in the name of progress. I was feeling let down with Kyoto and Japan in general. I was thinking I should have gone to China instead with it’s wow factor, long an inspiration for Japanese culture and art. Over the centuries the Japanese had moved away from Chinese culture perfecting their own calligraphy and preferred allusive otherworldly poetry. To be honest this love of the indirect together with the expressionless wandering lost in their internal, possibly formal, thoughts was becoming too abstract for my liking. I needed human interaction, even just a smile and not the fake smiles I was seeing whenever money was being transacted. I began to think maybe something far greater was going on, with the constant natural disasters and the brutal history of Japan. The parasitic upper classes has abused the poor with a form of taxation and limitations on movement designed to keep them in poverty and the noble class in servitude, the general translation for people as being the “ones held with a dagger against the eye.” Could these be the scars of a thousand years and I was just a simple foreigner passing through not worthy enough to feel their pain? I guess you could say Japan was making me feel sad, not for myself, but for them. Wandering through To-ji I gazed on the 17th century Kondo (main hall) a National Treasure and stepped inside to view the Yakushi Nyorsi triad and then to the 16th century Kodo (lecture hall) containing Kukai’s original statues carved in the 8th and 9th centuries, the dusty air very sweet from the incense. Near the Lecture Hall was a stall handing out free cups of plum tea sprinkled with gold leaf. If you liked it you could by a pack. What can I say, it was impossible to drink, just like a salt mouth wash, I managed to discreetly pour it down a drain. Later I came to a tea house and noticed Matcha (green tea) on the menu so tried a cup. On a summer’s day when the grass has been cut their is always a distinct smell, well that is how matcha tastes, for me undrinkable. Unfortunately for me there was no handy drain nearby so had to leave the teahouse quickly, eyes cast. It wasn’t until leaving To-ji that I noticed a walled area away from the main section. This seemed to be the shrines for the Kyotoites, seperate from the paid tourist area. 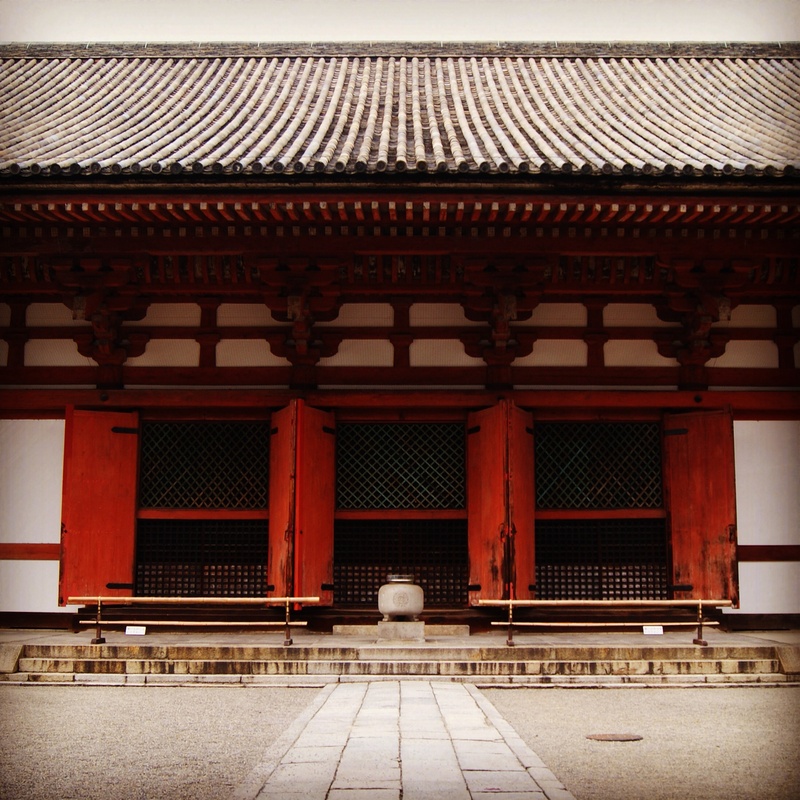 It was here that I felt something real, monks were chanting within the oldest building in the complex, the Mieido (1380), gongs were being hit while a cloud of incense hung in the air. At last I was experiencing something exciting, I was on cloud nine but only for a moment, to be hit by lightning, the glare of an old woman rolling her eyes as we were near a stone statue of a turtle which I guess she was walking towards to pray. It was there I realised Japan was just “nice” but very fake. Even after being snubbed by people in Tokyo when lost and asking for directions, even when being ignored when asking a teenage girl how to used a photobooth, even when a two faced waitress had laughed behind my back then smiled to my face when we paid the bill I had still saw the best in the Japanese people. The old battle axe in the temple was the last straw. Don’t believe the myth that politeness pervades in Japan, they bow and smile sure but it’s generally just for show. Japan is crashing towards the heap of the discarded countries, places that for me were never quite up to scratch. There is still time for this country to redeem itself, tomorrow is a new day and i’m endlessly forgiving. 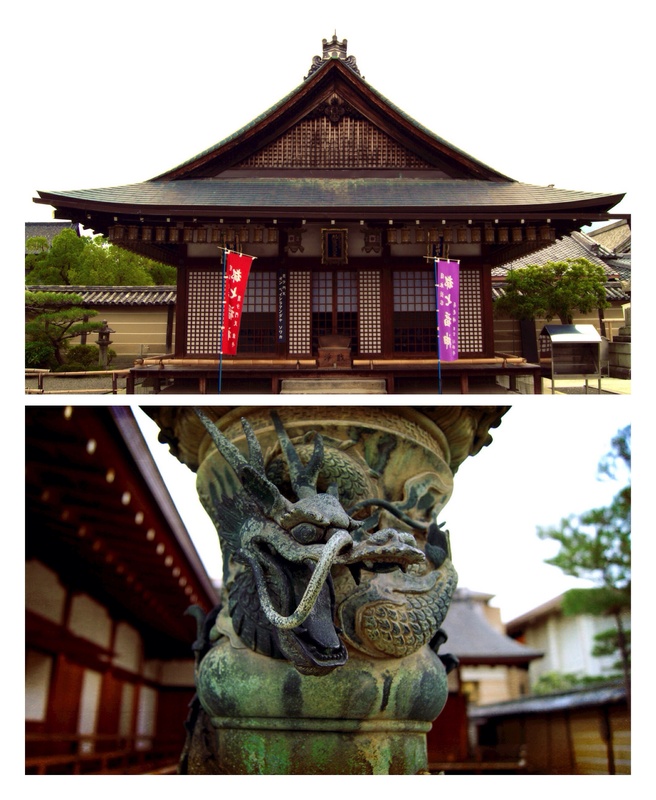 This entry was posted in Japan and tagged Buddhism, Japan, Kyoto, Minami, Pagoda, Temple, to-ji, Toji. Bookmark the permalink. ← The Blood Moon above Kyoto.